glasseyedave	free willDoes God want Obama in office?, God in government, Is it God's will for Obama to be in office?, seperation of church and state, The Gospel Accordingto the Gospel, The Gospel the church refuses to believe, What is God's will? So are we to take the Calvinist (Reform Theology) view of things, that man has no free will and God decides everything before time began. That men are only actors who have to live out what God has already set in stone as far as their decisions and outcomes. 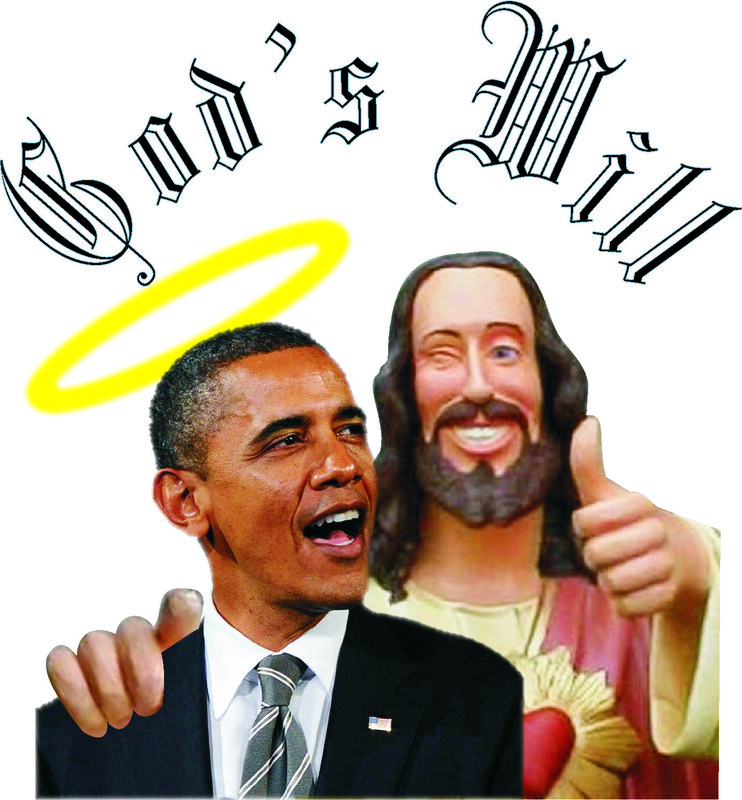 Therefore, it is God’s will that Obama is in office and all of his liberal, progressive, communist ideologies are what God wills? Are we to give praise to God for the man the we have in office and give thanks that he is continually attacking the founding principles and documents of this country, because it is God’s will? Sooooo… because some fools, who call themselves believers, not only verbalizing this type of doctrine they actually defend it, are we to sit on the sidelines and quietly say, amen? NO! As for me, I am to foolish for that. Is there any precedent in scripture that can give any light to this notion that just because Obama is in office it is God’s will? Well, there are two stories in scripture that I would like to bring to light. One describes a political leader coming to office, that was not in God’s will. The other is about a man God put in office who DID NOT do what God wanted him to. In I Samuel chapter 8 the people of Israel cry out for a king and Samuel being their judge is very disappointed in the people’s desire. Up to this time Israel has been a theocracy. The people of Israel were governed by God Himself through the judges that God had appointed. It was the judges who ruled Israel through the direction and guidance of the Living God. But now the people wanted a king and it hit Samuel hard. God had to set Samuel straight on the issue. Samuel thought the people where rejecting him, but God let him know they were not rejecting him, they were rejecting God as their King. But the thing displeased Samuel, when they said, Give us a king to judge us. And Samuel prayed unto the LORD. (7) And the LORD said unto Samuel, Hearken unto the voice of the people in all that they say unto thee: for they have not rejected thee, but they have rejected me, that I should not reign over them. The people understood what they were asking for and finally so did Samuel. They did not want God to rule over them anymore. They instead wanted to be like the rest of the nations around them and have a man rule over them. In todays’ Christian thinking, it is God’s will for Israel to have a man as king over them and to no longer have God rule over them. Their theology is so shallow and perverted they think that because it simply happened, it must simply mean it is God’s will, like so many false prophets and so-called words of the Lord. So this brings into contrast what these ill-equipped theological prognosticators are attempting to put forth as a spiritual truth. Are we to assume that God wanted to have His people rebel in their hearts and reject Him as their King? Or is this one of many examples where man does not do the will of God? Doesn’t this better serve as an example where a nation does not do the will of God? Just because a man or woman may be in office does not mean that it is the will of God. We can see in this glaring example this is a case of men doing what they want in government and not heeding the will of God. In I Kings chapter 11 Solomon had done evil in the eyes of the Lord and burned incense to other God’s. Solomon was commanded by God not to go after other god’s but he did not obey this command. So God was going to tear the kingdom from the house of David, only leaving Judah for the house of David. Jeroboam was a man who God, through the prophet Ahijah, was told that God intended to give him ten tribes to rule over because of the sins of Solomon. God’s will was to give to Jeroboam this kingdom and make a covenant with Jeroboam like He did with His servant David, if only Jeroboam would walk in the precepts of God like David did. And I will take thee, and thou shalt reign according to all that thy soul desireth, and shalt be king over Israel. (38) And it shall be, if thou wilt hearken unto all that I command thee, and wilt walk in my ways, and do that is right in my sight, to keep my statutes and my commandments, as David my servant did; that I will be with thee, and build thee a sure house, as I built for David, and will give Israel unto thee. What we read in scripture is Jeroboam essentially gave God the finger and did everything in his power to steer all ten tribes, known as Israel, away from the commandments of the Lord. Of course this resulted in God wiping all of Jeroboam’s descendents off the face of the earth. In today’s Christian thinking, it is God’s will for Jeroboam to lead all Israel after false gods. Their theology is so shallow and perverted they think that because it simply happened, it must simply mean it is God’s will, like so many false prophets and so-called words of the Lord. Not only does this story reveal men doing things completely out of the will of God while in office, so does the reason why God ripped Jacob in pieces in the first place. That would be Solomon not obeying the Lord and doing things he was commanded not to. Not only this, all the kings from Jeroboam all the way until the captivity of Israel serves as examples of men, who in office, would not do what was the will of the Lord. Judah, except for a few exceptional men, also followed in the footsteps of her sister Israel, in fact doing worse that Israel, until their captivity. The house of Jacob is a story of men in all stations of life, even that of government, not doing the will of the Lord. So let’s stop this nonsense about how things are the will of the Lord, even perversions of good government, justice and truth just because someone in political office does these the things. The doctrine of “simply happening, simply means it’s God’s will” especially in government is un-biblical. This kind of stupid thinking was the thinking of the false prophets and it did not save them from the terrible consequences of their choices and their sins! True believers in the days of the Kings of Jacob needed to stand up for the Word of God and today true believers need to do the same, if we are to escape our own coming judgement. But unfortunately God’s remnant was very small and people like false prophets more than the truth. Today is no different. This is reason 836 why the Church is dead and America is dying. If you have any further questions on this or other subjects, please make a comment below. Do you really think that God gave an eternal Jesus a bride that would die? Hmmm…. I think you are just focusing on the wrong thing perhaps. Remember, He comes back for one without spot or wrinkle… not a corpse. Stop this… really mann… stop this. Do not confuse the places you have been with the entire Church. Greetings, Glassyeyed Dave. I kinda lost track of you over time but was glad to have found you recently. While I fully see your perspective in this post concerning God’s ultimate will for the earthly realm, I see His will as being complex and made up of a decreed will, desired will, and permissive will (Decreed Will: ‘Let there be light’ ; Permissive Will: Gave satan permission to afflict Job ; Desired Will: ‘Not my will that any perish but that all come to repentance ). And I guess I would say I see His permissive will in Daniel 4:17 ‘ …… to the intent that the living may know that the most High ruleth in the kingdom of men, and giveth it to whomsoever he will, and setteth up over it the basest of men.’ Nebuchadnezzar was glorying in ‘my kingdom’ and God reminded him harshly via growing claws and grazing with the animals that only God determines/permits/allows/seats/ordains earthly rulers who are always ‘basest’ because they are flesh. As you say, Israel moved away from God and desired a flesh-and-blood king. Yet I feel God’s permissive will knew from before the foundation of the world that He would allow ‘kings’ to be part of the degeneration and that Christ would come as King of Kings. And that though He be called ‘King’, He remained ‘ Judge. ‘ In most every case in the Old Testament, God raised and lowered kings. Some of them were good. Some of them he seated because they were bad and what the people wanted. So I guess I do believe that in His sovereignty that God continues to rule over His earthly governement ordained for ‘good’. And I think it is more than irony that Judah alone was left to the House of David. Judah…the tribe through which would come the ultimate King of Kings…Christ. From before the foundation of the world, I am convinced God ‘knew’ each thought and each action of every man and all related outcomes. So in that sense alone which involves God’s decreed/desired/and permissive Will, I do believe He alone continues to work His ultimate will….as He is doing yet today with the remnant of Israel whom He made blind and deaf via Isaiah’s prophecy for the purpose of accomplishing a great purpose in the earth (Isaiah 6: 10-13). As the progression of American Presidents are seated/unseated, I remain so grateful I live in a nation whose government’s humanitarian heart continues to consider the lowly and the outcasts in its laws and helps. And in this same government and the nation over which it responds, we surely see that God has further removed restraints over satan and that God’s permissive will is ‘letting’ the changing of times and laws…exactly as in the days of Sodom. In the context of God’s permissive will, ‘mystery babylon’ is the ultimate example of God permitting satan’s final influences over those who give their hearts to him. But in the darkness of days, the glorious glow of the candle remains via Christ Church who is ‘in the world but not of the world.’ And contrary to His desired will….they are ‘few.’ So in that context, I do believe that God’s will is ultimate, that satan is allowed only the power permitted by God, that Free Will is a gift from God, and that God’s permissive will allows man to choose his own eternal destiny via his choice of either God or man (satan/evil)…Life or Death, that God’s desired will remains and will be fulfilled as the Bridegroom and Bride are united for eternity wherein will dwell only Righteousness, and that His decreed will is ultimately seen when He restores Eden and her inhabitants to again dwell face to face with the perfect Father..
Again, so glad I found you. I enjoy your posts. It is good to here from you again. I understand what you are saying about God’s will. But for me, Christians use God’s will as an excuse to be lazy and not the city on a hill or that shinning light. God’s will can and has become the excuse to tolerate oppression, tyrany, corruption, theft at the banking and finance level and I could go on. Because of the lack of the Christian voice and influence God is now going to judge our nation. But why would He be displeased, after all wasn’t it His will? You have absolutely helped me thank u my brother,I love the truth.